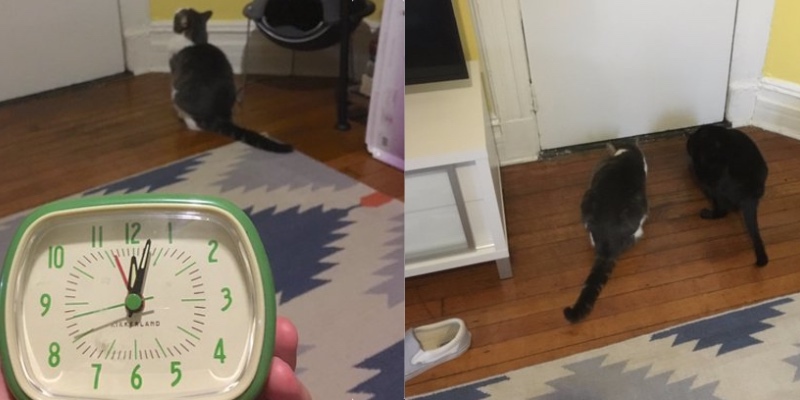 Adam Ellis from Manhattan, NY, has been posting the bizarre behaviour of his cats and other seemingly paranormal related activity on his Twitter account. It all started when he started having some strange dreams where he saw a child sitting at the bottom of his bed on a rocking chair. Adam also experienced sleep paralysis and that combined with strange dreams is something that is reported quite often. However, Adam went on to say the child had a large weirdly shaped head with a huge dent on one side and that the child got up and started moving towards him. One of the weirdest parts of the story is his assertion that his pet cats are gathering around his bedroom door every night at midnight. We’d guess that is either a very punctual and habitual mouse or something else is drawing them to the room…or it could be totally fake. In many cultures and myths cats are seen as in contact with other planes or realms. Civilisations like the ancient Egyptians and in popular culture from Lovecraft to Constantine, they are attributed unearthly powers. Adam’s also posted various clips that appear to show various objects moving about on their own accord. He reckons that his apartment is haunted and that the ghost is a child. You can follow Adam’s Twitter account here for more updates on what he and his cats are experiencing and see a summary on Storify.